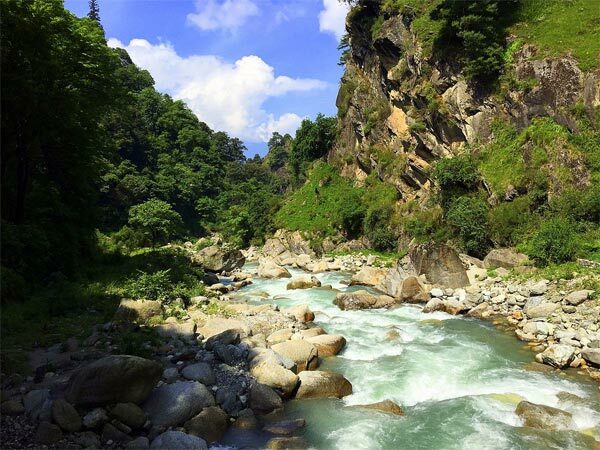 The virgin lands of Tirthan Valley are one of the best-kept secrets in the state of Himachal Pradesh and are blessed with incredible natural beauty and a plethora of delightful attractions to catch the attention of all types of travellers. Perched nearly 3 km from the entry of the Great Himalayan National Park, you will find plenty of adventurous activities to engage in at the Tirthan Valley. With the Great Himalayan range with snow-covered hilltops in the backdrop, Tirthan Valley is famous for trout fishing and has several foreigners visiting this destination each year. In fact, the number is much more significant than the number of locals itself. Enjoy a magical ambience and a lush green environment in the neighbourhood of the small and quaint hamlets; couple it with a pleasant weather all through the year and you have a beautiful tourist destination, a perfect environment for people looking for adventure, peace and tranquillity. The summer season and the start of the winter season is the best time to explore Tirthan Valley. There are three seasons experienced in this region. The summer season (April - June): The weather is pleasant during this season and it gives people a fantastic opportunity to escape the scorching heat of the summers. There are strong winds and a vast vegetation spread in the region with loads of flowers blooming, making it one of the scenic destinations in the area. The winter season (November - February): This season comes with a massive round of snow except during November. The climate can be quite harsh for first-timers, but the snow-covered environment and the small patches of vegetation make the overall experience worth it. The spring season (March - April): Spring is one of the most beautiful seasons blessed with meadows, orchids loaded with fruits and flowers offering picturesque backdrops. Add to that a pleasant weather with a slight breeze of chilly winds during the night and it makes for a perfect holiday. The road is the most convenient and preferred mode of commuting from central locations like Delhi. You can alternatively catch a train or a bus to reach this beautiful destination. By Air: Bhuntar Airport is the nearest airport to Tirthan Valley, approximately 48 km away. Charter Airlines provides helicopter services from Delhi as well. Catch a cab or a bus to reach Tirthan Valley. If you wish to explore the nearby areas, then you can alternatively catch a flight till Chandigarh and cover the remaining 134 km via a cab or a bus. By Road: Frequent bus services are running from Delhi. The buses would drop you till Aut (26 km), Jalori Pass (27 km), and Shoja (22 km) and then you cover the remaining distance via a cab. By Train: Ambala and Kiratpur are the nearest railway stations to Tirthan Valley. There are frequent buses and taxis available from the railway stations to cover the remaining distance. Several beautiful areas are surrounding the Tirthan Valley. So, be prepared to be spoilt for choices considering the options available at your disposal. Many beautiful resorts and retreats next to the pine forests of the Western Himalayas will surely catch your attention. The quaint surrounding villages and picturesque backdrops make it one of the top places to discover. Tall snow-capped mountains dominate the backdrop of Tirthan Valley. Unwind while birdwatching and then explore the dense forests and alpine meadows. The serene Serolsar Lake is one of the must-visit destinations in the region. You can also indulge in some trekking along the 6 km trail from the Jalori Pass. The rustic riverside homes are instrumental towards naming Tirthan Valley as one of the beautiful destinations in the region. Placed in-between fruit orchards, your search for inner peace would end here. There are several hidden waterfalls contributing to the ambience of the surroundings. If you stroll aimlessly or follow the winding roads through the forests, you will enter the beautiful regions of Gushaini, Banjar, Nagini and Shoja. Do explore the wood carving collections that are popular in this area. Other favourite spots to explore are the pristine Parashar Lake resonating with the unparalleled beauty and historic temples surrounding the lake, built in the 14th century. The Shringi Rishi Temple in the neighbourhood of Bagi is another famous temple that you should not miss. The Chehni Kothi is an iconic 1500-year-old castle built with wooden beams and stone slabs. The king of Kullu, Rana Dhadhia, resided in this palace. An earthquake in 1905 wiped off the top five floors of the castle. It remains to be the tallest freestanding structure in the Western Himalayan region. This unique destination has plenty to offer to all the adventure junkies. The valley provides the perfect environment for activities like fishing, trekking, safaris and exploring the beautiful villages. The Tirthan river offers a charming atmosphere for setting up secret fishing camps. The Himachal government well preserves the rich aquatic biodiversity of the river.